Emmy was a good girl. At least she tried very hard to be good. She did her homework without being told. She ate all her vegetables, even the slimy ones. And she never talked back to her nanny, Miss Barmy, although it was almost impossible to keep quiet, some days. She really was a little too good. Which is why she liked to sit by the Rat. The Rat was not good at all . . . 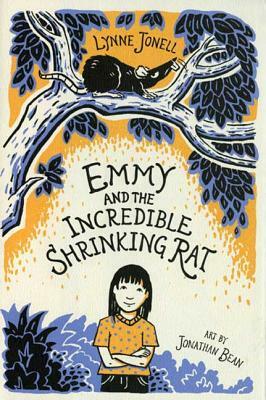 Hilarious, inventive, and irresistably rodent-friendly, Emmy and the Incredible Shrinking Rat is a fantastic first novel from acclaimed picture book author Lynne Jonell. JONATHAN BEAN received an M.F.A. from New York's School of Visual Arts and now lives in Harrisburg, Pennsylvania. A two-time winner of the Boston Globe-Horn Book Award, for At Night and Building Our House, he is also the illustrator of Big Snow, two picture books by Lauren Thompson, and Bad Bye, Good Bye by Deborah Underwood.